Elegant seaside restaurant specializing in Pacific Rim-inspired dishes. : Pitahayas sits gracefully above the beach, overlooking the waves crashing on the rocks below. Dine al fresco under the enormous palapa, in a private sea-view room or in the leather-chaired, elegant wine cellar that features over 200 international labels. Breads arrive studded with bacon, sausage or jalapeños. 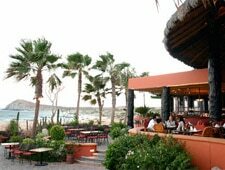 The Pacific Rim and continental cuisine includes fresh seafood from the nearby Pacific and Sea of Cortez, such as the combination of a petite filet mignon and half lobster tail or barbecue-glazed shrimp. Pitahayas signature dish, the Seafood Trilogy, is a compartmentalized platter laden with a grilled fish filet in fruit relish, lobster tail in vanilla bean sauce, and two jumbo prawns in butter sauce. Desserts include Xango, a roasted banana and cheesecake eggroll with sauce anglaise, a chocolate macadamia nut cake with coffee cream sauce, and a crème brûlée sampler.